Did you know that omega-3s can influence learning? That's why Nordic Naturals, the #1-seller of fish oil in the US is sponsoring a giveaway of $3,000 for school supplies to one lucky school. Nordic Naturals is committed to giving each generation what they need to grow healthy and strong. Nordic Naturals offers many options for how children and adults can get an adequate amount of Omega-3s! Read on to learn more about the What’s Essential™ School Supplies Giveaway, and to learn how to enter! You'll also find a Nordic Naturals Promo Code / Discount Coupon Code below! 1. 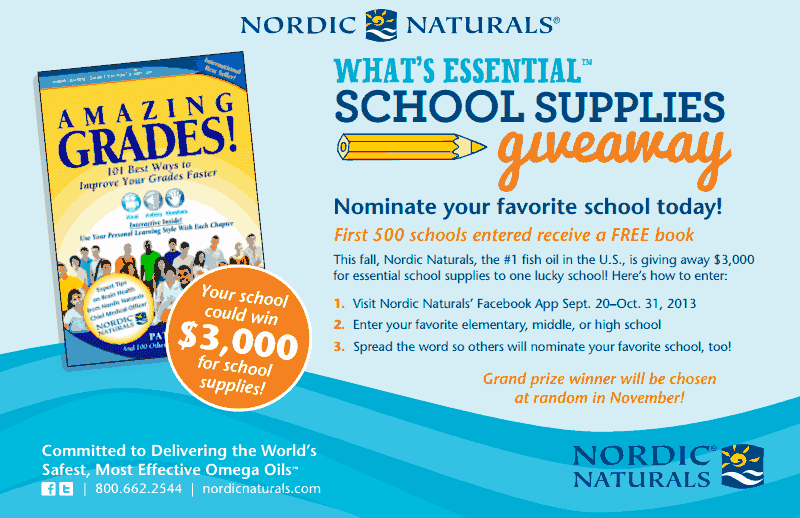 Friends and family can nominate a school via the Nordic Naturals Facebook app through October 31, 2013. 2. Public or private elementary, middle, or high schools in the USA are eligible for nomination. 3. In November, one school will be selected at random to receive a check for $3,000 for school supplies. 4. 500 of the nominated schools will receive a copy of Amazing Grades, 101 Best Ways to Improve Your Grades Faster by Pat Wyman. This book is a great resource for schools, teachers, students and parents. Read here to learn why! Thanks so much for nominating a school! You can use the Nordic Naturals promo code SSGIVEAWAY for 15% off of your entire order online. The promo code is good until 10/31/13. Disclaimer: I am disclosing my partnership relationship with Nordic Naturals in accordance with the Federal Trade Commissions 16 CFR, Part 255 Guide Concerning the Use of Endorsements and Testimonials in Advertising. 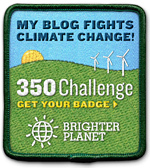 I will receive a small gift package of Nordic Naturals items in exchange for this post.